StationPlaylist offers our own reliable and affordable stream hosting. For visually impaired users, a comprehensive set of scripts are available for JAWS, Window Eyes & NVDA. Australian Independent Radio News has appointed StationPlaylist as preferred radio station software provider. An article on Radio Magazine discusses How to Get the Most Out of Automation. A leading radio magazine Radio World features a review of StationPlaylist. Another article is at the Broadcasters Desktop Resource. "I am amazed! I've used other automation / streaming products on my webcast, and I've got to say, StationPlaylist is simply awesome. Over the last year I've used (and paid a lot for) DRS2006 and SAM Broadcaster, and Creator & Studio out performs both of them in ease of use and feature set." StationPlaylist Creator + Studio integrate to provide a very affordable and powerful radio broadcasting software solution for terrestrial radio and internet streaming / webcasting. Also suitable for party DJ's and in-store music automation. Our software provides many time saving features not found in broadcasting software 10 times the price. From full live assistance for announcers / DJ's, to complete unattended radio automation, StationPlaylist will do the job reliably. Online Internet streaming has never been easier with Studio. Stream in multiple codecs including MP3, AAC+ (MPEG-4 HE-AAC), Windows Media, and Ogg Vorbis. "Thanks for your impressive product. I am a Master User on both Scott Studios WideOrbit and RCS NexGen, and find this to be most competitive with those two very sophisticated platforms." StationPlaylist radio automation software is being used by commercial and non-commercial AM & FM radio stations, internet streaming stations, clubs, restaurants, malls, and other stores. Over 14,000 licences sold! We pride ourselves on our support. Most email support queries are answered within 12 hours, often within 2 hours. We provide affordable and reliable Icecast stream hosting services. 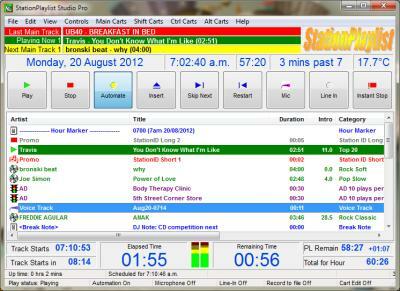 Studio is a simple to use on-air broadcast automation playout software for the studio and/or DJ. Plays all your media files with manual or intelligent / automatic crossfading. Play jingles, commercials, news, songs. live streams, live inputs from your sound card, satellite feeds etc. Includes an internet stream encoder, voice track / song ramp overlapping, many automation and live assist features such as 96 cart slots for instant jingles, timed events, time and temperature announcements while automated, compressor / limiter sound processing, website integration, and much more. Creator is a simple to use, yet powerful spot and music scheduler. Gain complete control over your station format using rotations of music categories and spot groups (jingles, advertisements, etc). Streamer is a stand-alone internet radio stream encoder. Stream audio from your soundcard to the world. Remote Voice Tracker enables your DJ's to record voice tracks within the scheduled playlist from home, to sound like a live show! Purchase Creator Pro & Studio Pro in a bundle, with over 22% off!